Sushi rolls filled with egg (tamagoyaki), carrots and shitake mushrooms. A Japanese dish consisting of small balls or rolls of vinegar-flavored cold cooked rice served with a garnish of vegetables, egg, cooked meats, or raw or cooked fish. Wet the end of the nori with water so that it seals. 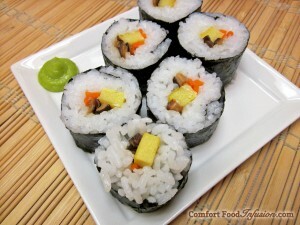 Sushi Rolls: Tamagoyaki and California Rolls. Delicious and simpler than you think! It is important to clean/rinse rice... 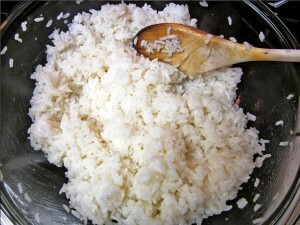 In a large sauce pan, cover rice with water and swirl. Drain water. Repeat about three times, or until water is relatively clear. Drain completely and add two cups water and salt. **Bring to a boil, uncovered over high heat. Once boiling, reduce heat to lowest setting and cover. Cook for 15 minutes. Remove from heat, transfer rice to a large shallow bowl. Cover with a damp towel and allow to cool. Combine rice vinegar and sugar in a microwave safe bowl. Microwave for about 45 seconds, or until sugar is dissolved. Once rice and vinegar is cool, pour vinegar/sugar over rice and, using the side of a wooden spoon, cut the rice (don't stir) to mix. Keep rice covered with a damp towel to prevent drying. Use water to dampen hands. 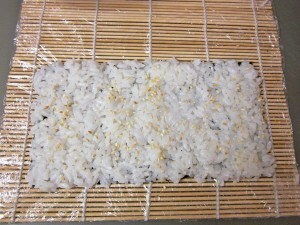 Spread/press sushi rice onto a sheet of nori. 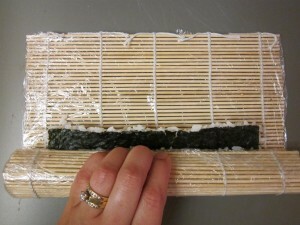 Leave about 1 inch of nori at the top for sealing. 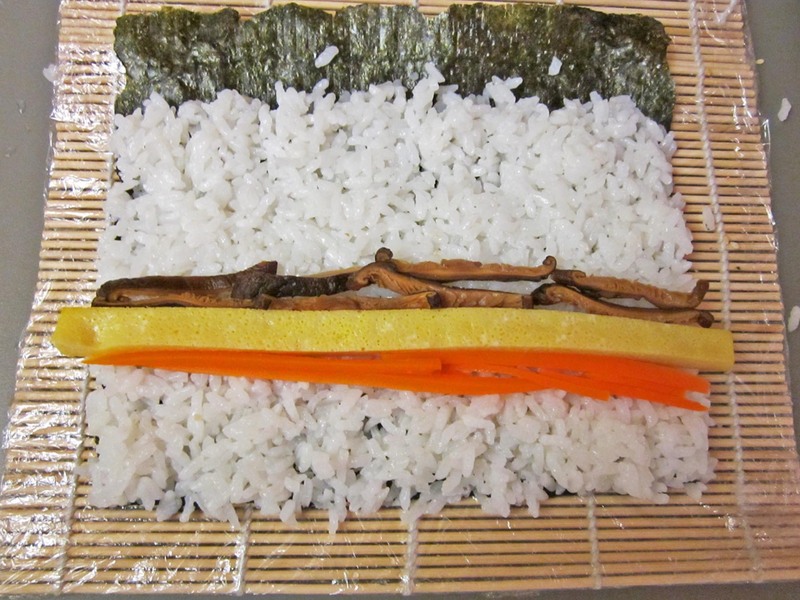 Arrange tamagoyaki, mushrooms, and carrots in the bottom half of sushi rice. 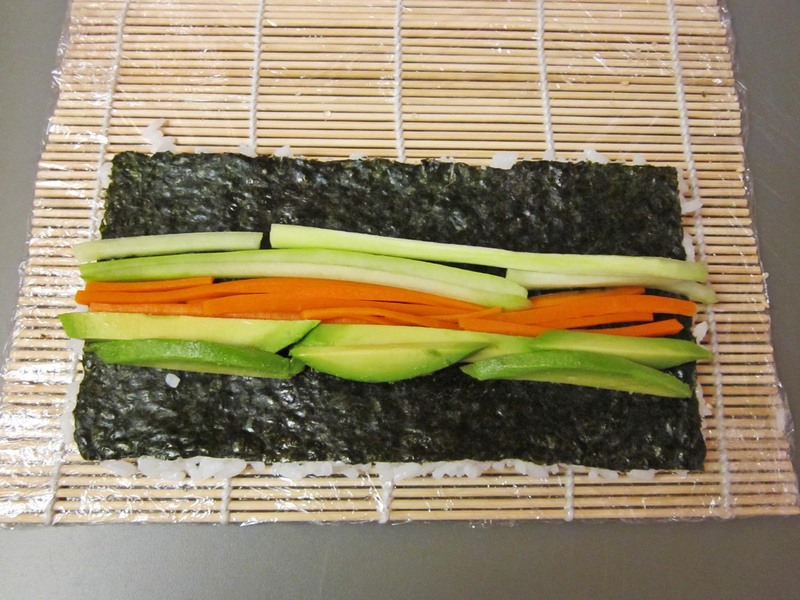 Using the sushi mat as an aid, roll away from you. 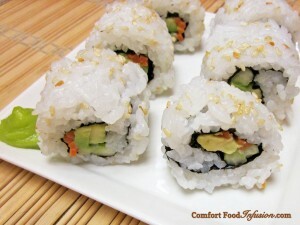 Use a slightly firm grip to roll, in order to keep the ingredients and rice tight. Dampen the end with a little water to seal. Using a clean knife, slice sushi log into 6-8 equal pieces. Clean knife often to ensure easy slicing. Use water to dampen hands. 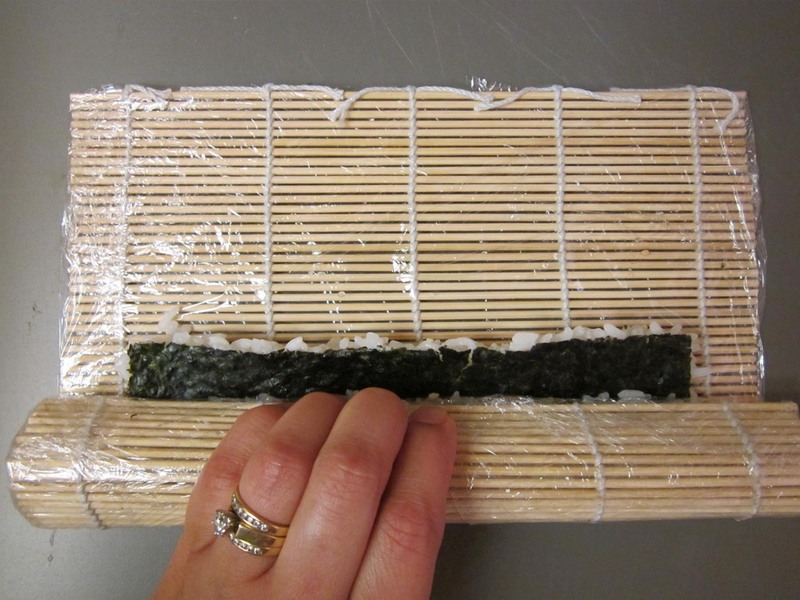 Spread/press sushi rice onto a sheet of nori, covering the entire sheet. Sprinkle with a little sesame seeds. 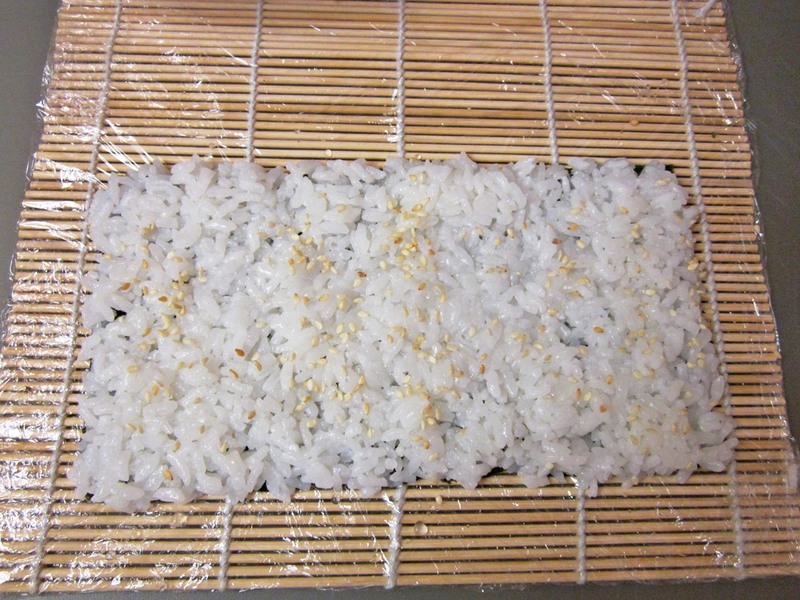 Carefully flip over sheet so that the rice side is down against the mat. 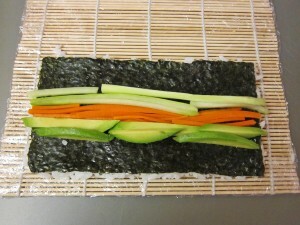 Arrange avocado, cucumber and carrots in the center of the nori sheet. Using the sushi mat as an aid, roll away from you. Use a slightly firm grip to roll, in order to keep the ingredients and rice tight. Edge will seal on it's own, against the sticky rice. *Directions for par-boiling carrots-- Bring a small pot of water to a boil. 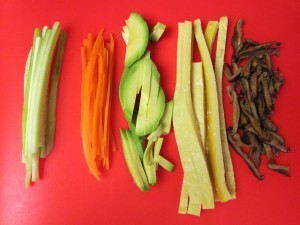 Add sliced carrots to boiling water and boil for about 1 and a half minutes. 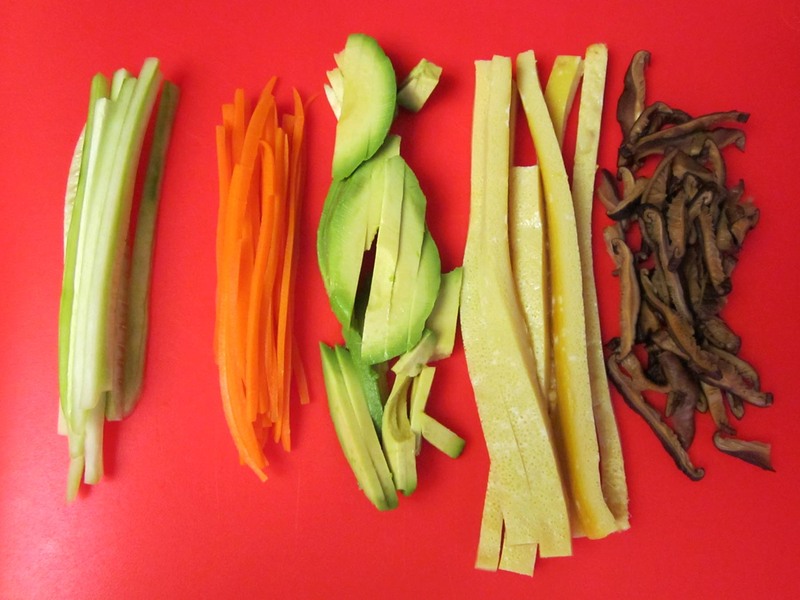 Remove carrots from boiling water and transfer immediately into a bowl of ice water. **At this point, you can use a rice cooker instead of stove top. Those look so yummi! They also bring back fond memories of good times with Toshi & her family. Happy to see that you have this on your blog of great foods.